After the Lord's re-instatement of the Earthin its orbit during His Varaaha incarnation, the off-spring of Brahma, Swayambhuva Manu’s Incessant devotion to the Lord and continuous effort heruled over the people successfully duringthe entire period of his "Manvantara"(71 mahayugas).This was possible to him only because of his Incessant devotion to the Lord and continuous effort to remember the Lord by recounting His glories. During this period, Prajapati Kardama whowas born from Brahma's own shadow,worshipped Lord Narayana for ten thousand years.He was eager to take up the work of 'creation' of the species, as instructed by Lord Brahma.Lord Narayana appeared before Kardama in theform contemplated upon by him,seated on the divine Garuda.The Lord blessed him to marryDEVAHUTI, daughter of Manu.He also blessed him to beget nine daughters.The Lord Himself would thereafter,be born to him as a son as the tenth childunder the name of KAPILA.Thereafter, the Lord promised "Moksha" to Kardama. என்றும் பூரணமாய் விளங்குகின்ற அபிராமி அன்னையே! நீ வீற்றிருக்கும் திருக்கோயில் நின் கொழுநராகிய சிவபெருமானின் ஒரு பாகமோ? அன்றி, ஓதப்படுகின்ற நான்கு வேதங்களின் ஆதியோ? அந்தமோ? அன்றியும், அமிர்தம் போன்ற குளிர்ந்த முழுச்சந்திரனேயன்றி வெண் தாமரையோ? இல்லை, என்னுடைய நெஞ்சம்தானேயோ அல்லது செல்வமெல்லாம் மறைந்திருகக் கூடிய பாற் கடலோ? தாயே! நீ எங்கும் நிறைந்திருப்பதால் எதில் என்று தோன்றவில்லையே! Abhirami! You are ever omnipresent, perfect and auspicious. Is your temple (abode) the left- half of my father Shiva?, or is it the final truth of the Vedas or is your abode the white-moon full of Ambrosia. Is your abode the heart of this simpleton in me ?or is it the sacred-milk sea? Would you condescend to tell me which your favourite abode is ? After the Lord's Varaaha incarnation,the off-spring of Brahma, Swayambhuva Manu’s Incessant devotion to the Lord and continuous effort heruled over the people successfully duringthe entire period of his "Manvantara"(71 mahayugas). During this period, Prajapati Kardama whowas born from Brahma's own shadow,worshipped Lord Narayana for ten thousand years.He was eager to take up the work of 'creation' ofthe species, as instructed by Lord Brahma.Lord Narayana appeared before Kardama in theform contemplated upon by him,seated on the divine Garuda.The Lord blessed him to marryDEVAHUTI, daughter of Manu.He also blessed him to beget nine daughters.The Lord Himself would thereafter,be born to him as a son as the tenth childunder the name of KAPILA.Thereafter, the Lord promised "Moksha" to Kardama. Being prompted by the Lord and advised by Narada,Swayambhuva Manu came to Kardama and got his daughter,Devahuti married to him. With the 'Yogic' powerobtained by his devotion to the Lord, Kardama revelledwith his love-lorn Devahuti in an aerial chariot (Vimana),assuming nine divine forms.Thereafter he got nine daughters and was awaitingthe arrival of the Lord in the form of Kapila.Instructed by her husband, Devahuti engaged herselfin devout worship of Narayana.In due course, the Lord Himself was bornas Kapila to teach mankind the means for attainment of salvation. Kardama then left for the forest fordoing penance as a means for his salvation.Kapila then became a great philosopherand taught the essence of his teachingsto his own mother, Devahuti. Although these are of the same tathvam (principle), more than Shiva, to Ambal (Shakti) is the greatness; this, Adi Shankara Bhagavadhpadhal explains in his 'Soundaryalahari' sthothram. ஒளிநின்ற கோணங்கள் ஒன்பதும் மேவி உறைபவளே. ஒளி பொருந்திய ஒன்பது கோணங்களில் (நவசக்தி) உறைகின்ற தாயே! நின் திருமணக் காட்சி தருவதைக் கண்ட என் கண்களும், நெஞ்சும் கொண்ட மகிழ்ச்சி வெள்ளத்திற்கு இதுவரை ஒரு கரை கண்டதில்லை. ஆயினும் தெளிந்த ஞானம் இருப்பதை உணர்கிறேன். இது உன்னுடைய திருவருள் பயனேயாகும். vevviya kaalan enmel varumbodhu-veli nirkave! Abhirami! you are present in the Sri Chakra that combines Shiva-angels four and five Sakthi- angels. Boundless is my joy, which is a feast to my eyes and mind, when I had a vision of your holy wedding with our Lord Shiva. Consequently I can feel spiritually elevated and enlightened and this is your blessing only. Oh Varada ! Hiranyaksha was roaming about in the knee-deep waters of the delugelooking for Thee. 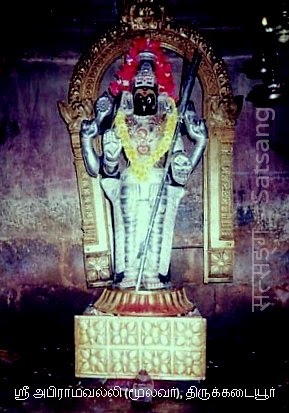 At that time, Sage Narada then approached the Asura,Hiranyaksha who was at that time wandering about in the waters in search of Vishnu.The waters of ocean hardly reached his knees.So you can imagine the huge size of the Asura.Narada was a great diplomat.He flattered the Asura and vehemently criticized the Lord to achieve his end. An interesting episode is mentioned in Puram poem 43. Mavalattān a prince of the Chola family, younger brother of Nalam Killi was playing dice with the Brahmin poet, Dāmappal kannanār. The former lost the game and in anger threw the dice on the victorious Brahmana. The poem describes this situation. The poet refers to important Vedic traditions. One. There was belief that a group of Brahman Rishis were following the hot sun to prevent the excessive heat of the sun on earth, so that the world may be saved. These rishis were called Vālakhilyas who were circling the earth along with the sun constantly. This is a Vedic lore. The poet of the Puranānūru refers to these sages who have sacrificed everything for the sake of the world and live only by air as their food. Having said that the poet says that your ancestors (Cholas) will never insult the Brahmanas which you have done now. It shows in ancient Tamilnad, Brahmins were highly respected and will not be insulted even by the ruling kings. Obviously because of their sacrifices for humanity , bearing the unbearable heat of sun for the people of the world. But the poet goes beyond what he said initially. As the poem seems to record an interesting episode which obviously is not a fiction but history we may see the poem itself. வெவ்விய காலன் என்மேல் வரும்போது-வெளி நிற்கவே. அபிராமித் தாயே! என் அகப்பற்று, புறப்பற்று ஆகிய பாசங்களை அகற்றி, என்னை ஆட்கொண்டு அருளிய நின் பொற்பாதங்களோடு, எந்தை எம்பிரானோடு இரண்டறக் கலந்திருக்கும் அர்த்த நாரீஸ்வரர் அழகும், தனித்தனி நின்று காட்சி தரும் திருமணக்கோலமும், கொடிய காலன் என்மேல் எதிர்த்து வரும் காலங்களில் காட்சியருள வேண்டும். Mother Abhirami! Salvage me from the sufferings that I might undergo,. when the demigod of death ‘Yama' confronts me. The Shiva, attracted by you with your winsome mien, and the vision of you both majestically at your marriage all these combined you bless me with your cleansing of my mind from worldly and heartily (sentimental) attachments. with your Lotus-feet that has taken me. Come as the above and wipe out the sufferings that might be inflicted on me by Kala, the demi-god of death. Two asuras were born to Kasyapa and Diti - Hiranyaksha and Hiranyakasipu. HIRANYAKSHA from his birth he was thirsting for battle. Not finding anyone equal to him in strength,he hit upon a plan to attract the attention of the Lord,the sworn enemy of the Asuras. He removed the earth from its orbit and submerged it. The earth is mythologically represented as Mother Earth - Bhoomi Devi, who is married to Lord Narayana.The Asura then roamed about menacingly across the waterswielding his mace. He heard from God Varuna,the God of Waters, that Vishnu was the only match for him.Bhoomi Devi being the dear wife of the Lord, the Asura expected that a fight with the Lord was imminent. Then Swaayambhuva Manu who was engaged in the work of creation, saw the earth emerged in water, untimely (when there was no Pralaya). 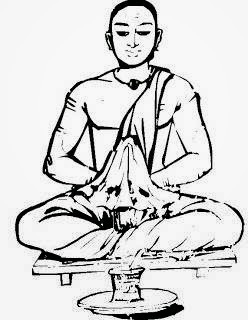 He went to Satyaloka, along with the sages and met Brahma who was serene and happy owing to his devotion to Thee. 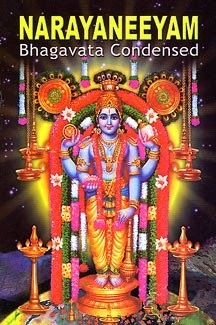 மதி சயம் ஆக அன்றோ, வாம பாகத்தை வவ்வியதே? அபிராமி அன்னை அதிசயமான அழகுடையவள்! அவள் தாமரை போன்ற மலர்களெல்லாம் துதிக்கக் கூடிய வெற்றி பொருந்திய அழகிய முகத்தையுடையவள்; கொடி போன்றவள்; அவள் கணவன் முன்பு ஒருநாள் மன்மதனின் வெற்றிகளையெல்லாம் தோல்வியாக நெற்றிக் கண்ணைத் திறந்து பார்த்தார். அப்படிப்பட்டவரின் மனத்தையும் குழையச் செய்து, அவருடைய இடப் பாகத்தைக் கவர்ந்து கொண்டாள், வெற்றியுடைய தேவி. madhi sayam aaga anro, vaama paagaththai vavviyadhe? Goddess Abhirami's physical form is quite marvelous. She is like a beautiful, slim creeper with enticing face and she is with many victories to her credit. She is the successful Goddess in getting the left half of our Lord Shiva, who once with his fore-head- eye, smashed the ego and pride of Manmadha, the consort of Rathi! O Lord of Guruvaayur! as creation progressed, the divine sages Sanaka and the others wanting to pay their respects to Thee went to Vaikuntha loka.